Of course Phoenix had on a diaper of the diaper brand the go-see was for, it's nice to wear the brand you are going too, ya know. Phoenix sleeps great in his stroller and I had to wake him, he was fed before we left and woke up refreshed and ready with smiles. In the room are about 10 other parents: mothers/strollers/Dads. There wasn't much of a wait, since the casting director had pre-selected the babies that were going to be seen. Basically right after I changed Phoenix into the shirt it was his turn. While I had changed his outfit I listened and watched out of the corner of my eye how the photogapher came in and took the babies with her to be photographed in another room across the hall while the parent/guardian/adult waited in the waiting area and soon the photographer came back with the baby and said something about the baby's performance. I bounced him on my legs a little since he loves standing and jumping and cooing and it puts him in a happy mood, and quickly he's all set! Then the photographer came in and said, "Phoenix..."
And I jumped up with Phoenix in my arms and happily handed him, my love, my son, my little prince, my champion, to her. No comp cards were needed. No portfolio was looked at. While waiting the few minutes it took for his photo to be taken I listened to see if I could hear him crying. No cry. Of course, no cry, Phoenix loves people and he is such a little ham. Awww. Of course he did, he talks non-stop, cooing and loving listening to himself talk. I think he coo's so much because we read to him so much. Anyways, when it comes to the job: Well we'll see. With modeling it's all about the we'll see. Can your baby have personality/ a calm nature when being held by a stranger.Does your baby have a friendly, happy persona and smile? Can your baby lay on his back or tummy, sit there, without being fussy. 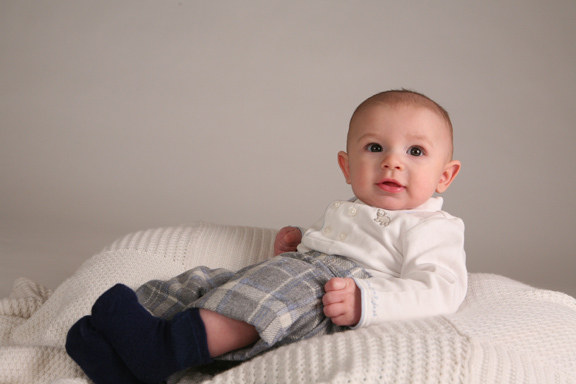 These are good traits of a baby model. We will keep you posted on our baby modeling adventures! We've started the Phoenix Baby Book Club.